So who is Masako Natsume, what did she do and why is this page about her? Masako was one of the four stars of what was to become a cult oriental fictional and semi supernatural TV serial made in Japan and based very loosely around a boy priest’s journey from China to India. The series was filmed in 1978 and 1979, but as I remember was shown in the UK (and across much of Europe) around 1980/1981. The young Buddhist priest was called Tripitaka (pic right) and he was given the task of travelling to India to recover some religious texts. It sounds serious, but “Monkey” as the series was known in the UK (after the main star), was anything but. As of now (mid February 2006) Monkey is been repeated on ITV4 at 6.00pm on Thursdays and Fridays, but in short here is what the story and its major characters are all about. Monkey (who literally is the King of the monkeys on earth) is both an immortal being and a “naughty monkey”. He upset the Gods and was buried under a mountain for hundreds of years as a punishment. He has however been given the chance to redeem himself by aiding a young priest on his journey and this, it is hoped, will teach Monkey some values. Also assisting Tripitaka (the priest) are “Sandy” (a water monster) and “Pigsy” (a greedy pig monster). The catch is that all three of these characters appear in human form and all (especially Monkey) have super-human powers. As an example monkey has two gifts. One is a fighting staff that shrinks down to a couple of inches in length and which he keeps behind his ear. The other is a cloud on which he can travel the skies and he raises this with an odd blowing action on his fingers. Together they make an unlikely, but action and comedy packed troupe of supporters for the priest. Week by week they all journey on their quest with Tripitaka, learning values like loyalty, love and respect, whilst fending off monsters and demons who obstruct their path. Its quiche, slightly camp, but more than anything else light hearted fun with quiet embedded morals. I wish they still made TV like this today. So what about the young priest Tripitaka (a.k.a. Masako Natsume)! Tripitaka had achieved enlightenment (the Buddhist goal) and he along with the Buda himself (and a celestial guide and message carrier) all appear with a reverse gender in the series. i.e the Buda is a woman and, more significantly, Tripitaka is the breathtakingly beautiful actress Masako Natsume (pic left). Don’t ask me why. The story so far is great, and in the series it remains that way with lighthearted humour, plenty of "cartoon style" fight scenes and Monkey literally playing the monkey. In reality however Masako Natsume, who became a massive star in Japan following the success of Monkey, died tragically of Leukaemia just half a dozen years after the show was made in 1985. She was aged just 27. Something that I have only just discovered. 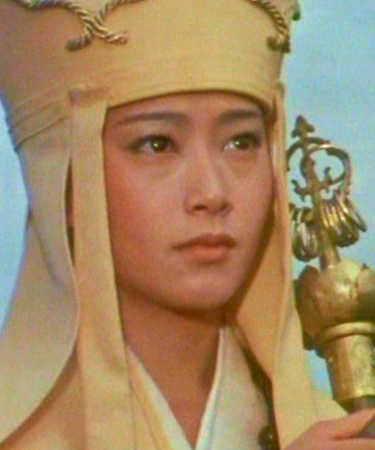 When Monkey was originally running (circa the turn of the eighties) I was a student and myself and several of my friends were extremely relieved to discover that Tripitaka (who we all quietly fancied) was in fact a girl and that our sexuality was not in question – it was a worrying time! We later had her pic’, both in “Tripi” guise and as the model/actress she really was posted up and she remained one of my fantasy figures for quite some time. So, since the web is full of crappy pages about crappy things, I thought I would add another crappy page, but one about someone who on screen (and I would like to think of it as well) represents the complete opposite – total visual perfection! 2. Visit this fantastic site monkeyheaven.com which includes details about the magical and irrepressible ape himself, the ugly, greedy and lustful pig, the lanky, but well mannered water monster and the truly celestial, awesomely beautiful and totally enlightened Tripitaka. 3. Bottom (opposite), too beautiful for words... she looks even better than I recall from 25 years ago and she can never be remembered any other way! If you like Monkey, also re-showing (as of early 2006) on the same TV channel is "The Water Margin". This is another oriental serial about a group of heroic outlaws (a la Robin Hood) fighting against the evil dynasty of the Emperor. The main character is ace swordsman Lin Chung. Also, as with Monkey, it has a fantastic theme tune! Alternatively, for something completely different go to the main page of this site. It is actually a destination guide and has nothing what so ever to do with Japan, TV, monkeys, pigs or anything vaguely supernatural. I just like to add an "off theme" page from time to time! I have no consent for the use of these pics, so I hope no one objects! Originally posted 21.02.2006 and updated (slightly) 8 Oct 2007.